mommy's reviews: Snore No More with PureSleep! Right before I found out I was pregnant with Isaac, my husband began making comments to me on how sleeping next to me was like sleeping next to a lumber jack. Yes, I snored. Not only did I snore, but I snored loudly. I wasn't sure why I was snoring (I typically have issues with snoring when I am pregnant so I should have taken a pregnancy test right then...LOL!) and it really bothered me. Things took a very bad turn for the worst and one night, my husband resorted to sleeping on the couch. I remember laying in my bed in tears...wondering what I would do if I could not find a cure for snoring. It was AWFUL. 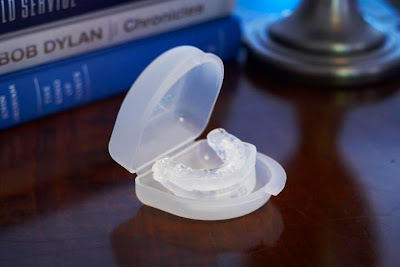 Co-invented by a dentist and an Ear, Nose & Throat Specialist, PureSleep has been used in clinical practice for over 15 and years to treat snoring.PureSleep is a self molded retainer that is FDA-cleared to reduce snoring by holding your lower jaw slightly forward of its normal position while you sleep. It opens your airway and eliminates the vibrations we all know as snoring. No vibrations, no snoring! As you can probably imagine, I was immediately intrigued. You always hear about men snoring but I seldom hear about a woman having this problem. Either they don't exist or they never let anyone know about it! I had also exhausted all the traditional "cures" for snoring...sleeping with my head elevated, nose strips, etc. NOTHING worked. So, for this review I was sent a PureSleep device to try. I was sent a brief questionnaire to see if I would qualify for a device and after filling it out, I was definitely qualified...meaning I had no outstanding medical conditions that would interfere with this product. This mouth piece comes in two pieces so that you can adjust it to fit your mouth properly prior to making the oral impression. Once you have snapped the two pieces together, you are ready to prepare the device for fitting. To do this you will first want to brush your teeth to be certain there is nothing in your teeth that would hinder a proper fit. Then, boil one to two quarts of water. Heat the entire device in the boiling water and remove after one minute with a slotted spatula. You may need to use the spatula to hold the device completely under the water. Cool the device for 10-12 seconds ONLY...not following this step could result in burns to your mouth or the plastic will harden. Hold your jaw forward and bite down HARD to make an impression of your teeth in the softened plastic. You will hold that position for 45 seconds. I will say here that I had difficulty with this. At the time, I was in the first trimester of pregnancy and was severely nauseous. This caused horrible gagging while I was trying to fit the device. My poor hubby thought I was throwing up when really, I was just trying to hold this thing in my mouth! Once the device has been fitted to your mouth, run it under cool tap water. If you need to, you can trim excess plastic from the device with scissors as this will help it feel more comfortable in your mouth. I did try the PureSleep device for several nights but due to my strong gagging reflex I was unable to continue. Thankfully, my snoring subsided shortly after my son was born and I have been fine ever since. I do pull it out once in a while and try it and when I use it, it does work for me. The only complaint I have is that my teeth get sore but that is normal and will go away once your mouth adjusts to the device being in there. The PureSleep reviews that I read are fantastic and people just love the results it gives them. It has saved countless marriages and people are sleeping better at night and feeling rested in the morning thanks to this device. You can check out PureSleep's website for more information and testimonials and also for purchasing information. Right now, you can try a PureSleep device for 30 days for just the cost of shipping and handling...check it out! Also, you can find them on Facebook as well as Twitter. Disclaimer: I received no monetary compensation for this post. I did receive a free PureSleep device for review purposes. All quotes and stock photos are from the PureSleep website and email. All thoughts and opinions are 100% mine. My son Dylan,22 yrs. was diagnosed with severe OSA(obstructive sleep apnea) at age 18yrs.and has been on a CPAP machine ever since then. He would snore so loud , it was hard to sleep in another room..and then he would suddenly stop. Because he wasn't breathing..and then he would snort and then breathe again. Would this pure sleep thing be something he could use in a situation where he didn't have his CPAP machine or if it quit working? He hates the whole mask thing and isn't looking forward to having to wear it for the rest of his life. Hi Melanie, Thanks for your comment. :) I am not sure about this device replacing a CPAP machine. I would recommend contacting the company and asking them, or your medical doctor. Thanks again!